Alarm clock icon, flat style. Alarm clock icon in flat style with long shadow. 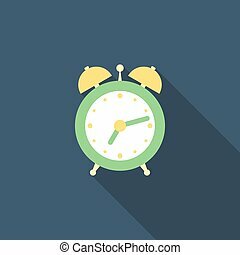 Alarm Clock icon flat style vector symbol wake up concept on white background for graphic design, Web site, UI. Alarm clock icon. Flat design style. Vector Illustration isolated on white background.